Tag Archive | "HURT 100"
7 miles- a run I can often do in the morning before work or even squeeze in during my one hour lunch break. I fell 7 miles short of finishing the HURT 100 back in Jan 2017. That was my first DNF (did not finish). I took not finishing it quite personally. I have finished everything I had started up until that point and couldn’t leave this unfinished. I am just not wired that way. As soon as I returned home, I was determined to go back in 2018 to finish it. Needless to say those 7 miles would fuel what would be my most intense year of training to date. In order to succeed the following year, I had to examine what didn’t work the year before. I figured out three things: a) I needed to move faster (especially at night). b) I needed to work on my hiking skills and c) I needed to stay fueled and hydrated properly during the race. I really wanted to find terrain that would mimic the race course as much as possible. Anyone who has done HURT knows that is not an easy task to replicate that twisted and grueling landscape. 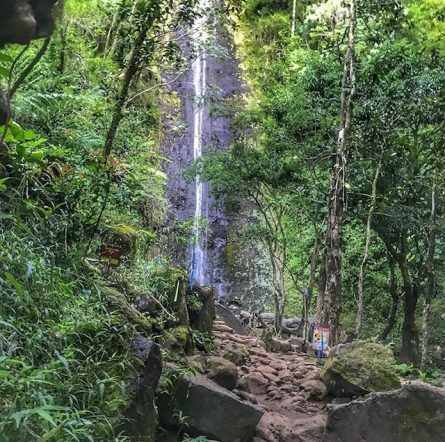 The HURT 100 boasts 24,500 feet of climbing. It consists exclusively of technical, single track trail on surfaces that include (HUGE) roots, rocks and soil in a wide range of conditions from sun baked clay to mud of varying depth. Sudden hairpin turns and steep inclines of up to approximately two miles in length are a common occurrence. Very few sections of the course can be run with a consistent stride for more than several hundred yards at a time. There are a total of 20 stream crossings. The Bruce Trail, here in Ontario, is filled with rocks and roots so I spent a lot of time on this trail getting my feet used to that type of terrain. As a flatlander, I needed to improvise on trying to get some good climbing in. I spent hours doing hill repeats, climbing on the treadmill, stair climbing, and hill work on the elliptical. In addition, I was trying to make the legs even stronger through strength training. I spent morning, lunch hours, afternoons after work and at night getting the training in. Most days were double or triple workouts. I wasn’t even sure I was in the race yet. (The lottery didn’t happen until August). Simply put, from February to August I was training for a race I wasn’t even sure I was going to run. I woke up some mornings wanting to do nothing but sleep. But in the corner of my eye I could see the HURT 100 shirt from 2017 hanging in my closet (never worn) and that was enough for me to get up and out of bed. It’s important to ALWAYS remember why you are doing something so you continue to chase it. I ran quite a few races in 2017 but I felt the following three would help immensely in getting me ready for the HURT 100. I signed up for the Cruel Jewel 100 (close to 110miles) , Barkley Fall Classic ( “50km”) and the Grindstone 100 In Virginia. All three were challenging in different ways. I spent 2 nights completing both hundreds and the BFC had its own unique climbs. I didn’t run any of them fast but with each race I was developing my mental strength and stamina which I knew I would need to complete the HURT 100. Fast Forward to Saturday January 13, 2018. 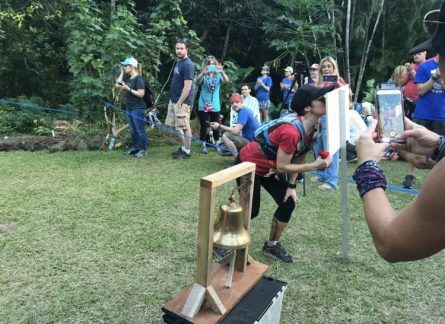 I was at the start line of my second attempt of the HURT 100. Dan, my husband, was right there by my side. He has and continues to be my biggest fan and supporter. As I was trying to soak in this second chance, I couldn’t help but feel nervous. So many hours of hard work and sacrifice brought me to this moment. I knew there was nothing more I could have done. I had a great support system at the race and back home. The race started and all those nerves went away. I broke up the race in parts, just focusing on getting from one aid station to the next. I finished the first loop in just under 5 hours and 20 minutes. I am not sure even now if that was too fast. All I knew was that I needed to be faster than last year. The course was just as beautiful and tough as I remembered it. I had a quick bite to eat, changed socks, and started loop 2. It definitely got warmer and I seemed to be getting hungrier faster. I decided to eat every 45 minutes and eat large quantities of food at the aid stations because at HURT there is always a monster climb after every aid station. I got through loop 2 before dark and it was here where I took a few minutes to change clothes, devour a monster cheeseburger from Dan, and get ready for the night portion that would cover the jungle during loop 3. Last year loop 3 was my race breaker. I lost so much time in the dark that I started loop 4 chasing cutoffs the rest of the race. I made sure this year to have a good headlamp and flashlight and neither disappointed. Navigating HURT during the day is hard but having to navigate it during the dark feels like you are running a completely different and more sinister race. I finished loop 3, 1.5 hours faster than last year. This gave me a huge confidence booster although I wasn’t celebrating just yet. I still had 40 miles to complete. I was also very lucky to have shared some good miles with Joshua Holmes. We were never more than 15 minutes apart. I do believe without a doubt he helped push me through that third loop. I was quite sleepy during loop 4 but needed to stay awake and focused on the trail to avoid a fall or injury. I never felt alone during the race. It always encouraging to see runners on the course and every aid station was lively and celebratory no matter the time. 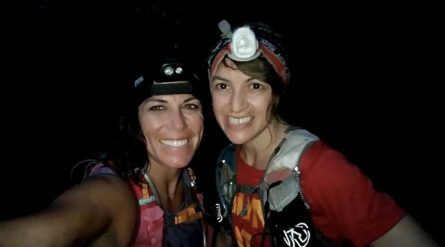 I got to see Andrea Kooiman not only at the Nu’uanu aid station where she was volunteering but also at night when she paced Joshua. She had DNF’d and time out at mile 93 the year before I did. She returned last year to successfully finish the race. Our paths crossed many times and this always lifted my spirits. I could often hear her from as far as 2 miles away. The ‘Nu’uanu Boom-Box’ as they called her on the trail. Both Andrea and Joshua were a great source of support for me as I got ready during 2017 to attempt HURT the second time around. We bonded at several events including the Badwater Salton Sea where we were a 3 person team that had to stay together for all 81 miles. During the 4th loop (80 miles in) I saw my second sunrise and finished that loop leaving about 9 hours to complete the fifth and final one. I just needed to keep moving to get that buckle. This is where the extra ounce of mental toughness I developed during training and running harder trail races came in. A pacer ran with me for about 14 or 15 miles and this made the time go by somewhat quickly. As I left the Nu’uanu aid station at mile 93 (one last time and with time to spare!) I felt overwhelmingly joyous. I was going to complete those 7 miles that I couldn’t complete last year. Although it was still 7 difficult miles to finish the race, it felt like a victory lap of sorts. The past 12 months of hard work had paid off. 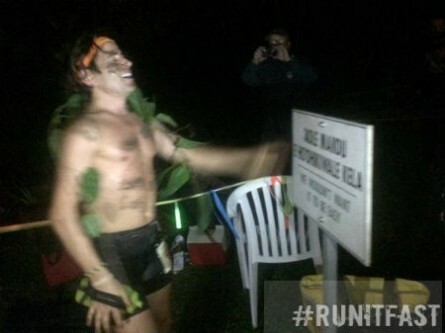 Coming into the HURT 100 start/finish area for the last time is a feeling I soon will not forget. I lifted my hands up, rang the bell and kissed the sign in a time of 35:40:15. I had done it…all that hard work…redemption! And as the sign says “We wouldn’t want it to be easy.” That’s good because I wouldn’t want it any other way. Here is a look at where everyone is running this weekend. We had just 21 responses this week. Good luck to everyone and Run It Fast! 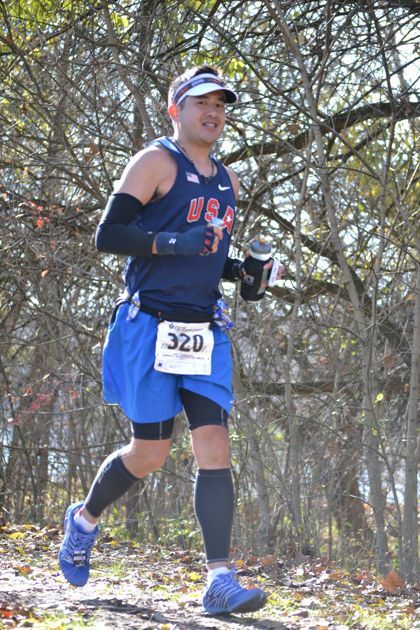 Marathoner/ultramarathoner Hideki ‘Kino’ Kinoshita has completed 112 marathons and ultramarathons to date. He has completed them in 47 states and 4 continents. 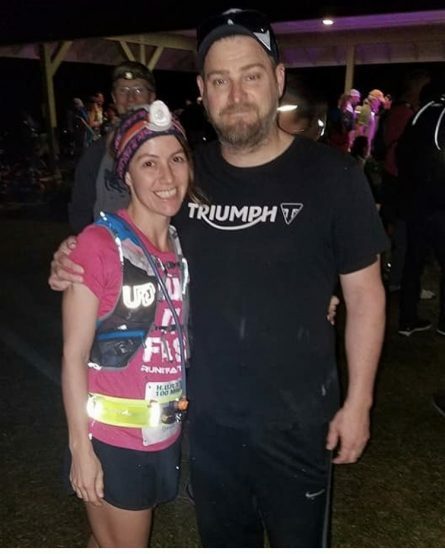 23 of his 112 have been ultramarathons. So Kino is well accomplished in having run races all over the globe. He has done all of his marathons since September 21, 2008. An amazing feat in such a short time. His times for these races all show that he has an inner drive to not just finish them but to perform at a very high level, no matter the race or distance. There are still races that Kino hasn’t run yet that he hopes to one day. This is undoubtedly the top goal race for most 100-miler ultramarathoners in the Western Hemisphere. Not only is running 135 miles a challenge, but try doing it by “running on the sun” (title of a 1993 documentary on Badwater 135) in the hottest place on the planet (according to Wikipedia, Death Valley’s Furnace Creek holds the record for the highest recorded temperature ever, at 134 °F (56.7 °C) at the hottest time of year in July, and climbing 3 massive hills along the way, including the final 13 mile death march up to Mount Whitney Portal, the tallest mountain in the Lower 48 States. 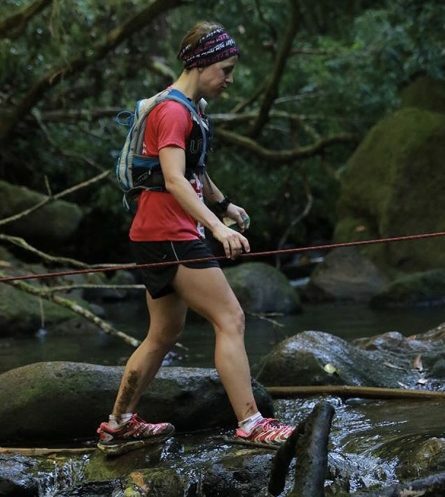 All this adds to the mystique and challenge of attempting this grueling ultra. Firstly, it is an unwritten highly suggested rule that you crew for a runner before attempting this race yourself, so that you can emerse yourself into hell before sanely determining if this race is right for you. I have yet to crew, but if I had only one last race in me that I could complete, Badwater would be it. Thank goodness it is no longer Badwater 146, with the final 11 miles up Mount Whitney eliminated as part of the course! Anyone who has completed this race is a running legend in my eyes. Such legends include friends like Ryoichi Sekiya, Brittany Klimowicz, Tony Portera, Phil McCarthy, Iris Cooper, Michael Wardian, Dave Ploskonka, Dave Carver, Ed Ettinghausen, & Mike Miller. Hearing each of their adventures, along with those who have has captivated my imagination. Western States Endurance Run (aka “Western States 100” or “WS100”) is a point to point 100-mile ultra from Squaw Valley to Auburn, CA that runs downhill through the Sierra Nevadas. It is a race that captured my imagination while reading Dean Karnazes’ “Ultramarathon Man: Confessions of an All-Night Runner” book. This is a course that legends like Gordy Ainsleigh, Scott Jurek, Dean Karnazes, Geoff Roes, Anton Krupicka, Glen Redpath, & Kilian Jornet have traversed. WS100 is the 100 that started it all when Gordy Ainsleigh’s horse came up lame in what was then a horse race (belt buckles were awarded for completing the race, and that tradition has carried over into the running version of the race with runners who finish within the 30 hour time limit receiving a bronze buckle and those who finish within 24 hours, a “sub 24”, receiving a silver buckle), and then decided to return the year after in 1974 to traverse the distance on foot. He proved that it was possible to cover 100 miles within 24 hours when Ainsleigh finished in 23:42. To learn more about the history of this race, read up on it on Wiki: http://en.wikipedia.org/wiki/Western_States_Endurance_Run . Here’s a list of WS100 course records: http://www.ws100.com/recordholders.htm. Ultra Trail du Mont Blanc, also known as UTMB, is Europe’s premier trail ultramarathon that stats in the famous ski village of Chamonix, France and runs around Mont Blanc in the French, Italian, & Swiss Alps, along a hiking trail that normally takes 7 to 9 days to traverse. The distance is roughly 166 km (~103 mi), and varies yearly due to safety reasons. It also features significant elevation changes (+/- 9,400m to +/- 9,500m, ~ +/- 30,000 feet) and nasty weather. The event began in 2003, with only 67 finishers out of 722 runners. It has since grown to feature ~2,500 runners. Spanish mountain goat, Kilian Jornet, who was raised in the Pyrenees Mountains is a 3-time champion (all by the age of 23) of this race (along with being a WS100 & Pikes Peak Marathon championship) that features the world’s best trail ultra runners. Inclement weather forced race organizers to host abbreviated versions of the race in 2010 & 2012. 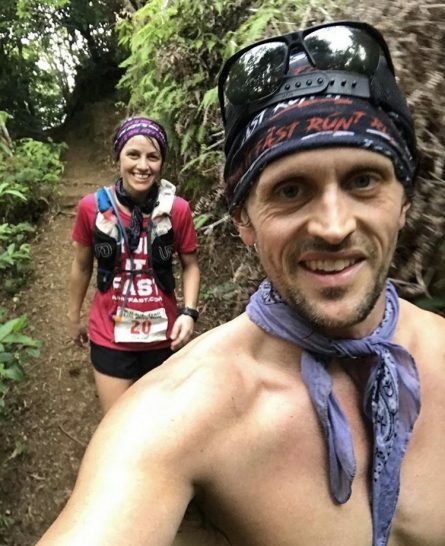 What made me realize the difficulty of this race was when American legends Geoff Roes and Scott Jurek both DNF’ed with Roes admitting that he felt “destroyed” by the race. H.U.R.T. stands for Hawaiian Ultra Running Team, and the name is as valid as advertised. 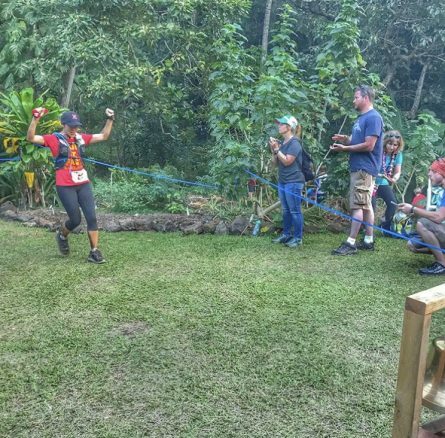 HURT 100 is notorious for a high DNF rate, even with a 36 hour time cutoff, due to its crazy elevation change and wet & humid conditions. Those who log 62mi are credited with a 100K finish and earn a 100K buckle. How’s this for a description? “There is over 24,935 feet of elevation gain and loss over the course of 100 miles. The gain comes in short sections no more than 2.1 miles at a time. There are very few sections where you can run with consistent stridefor more than a few hundred yards at a time. This course requires that you pay close attention to your footing at all times! The down hills are much worse! There are a total of 20 stream crossings, two per lap, prior to the Paradise Park aid station and prior to the Nuuanuaid station. If the river is high due to rain, we may forego the stream crossing. Expect wet feet every time you enter and leave the Jackass Ginger (Nuuanu) aid station. 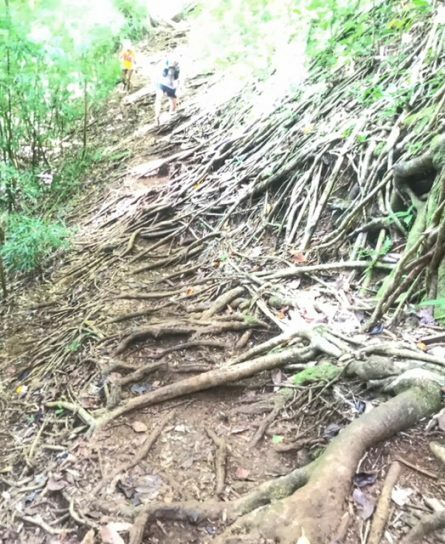 The trail is composed of a moderately packed dirt surface with lots of roots and rocks, which are very slippery when wet. At night there will be dew, which makes this trail extremely slippery. 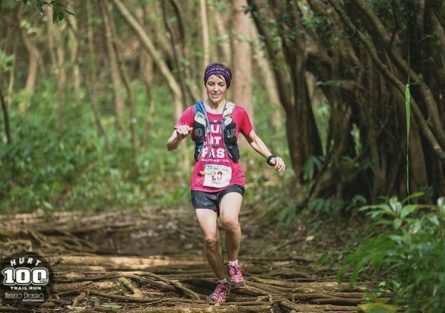 If it rains (which it will), there will be plenty of mud.” Hawaii holds a special place for me, so what could be more special than running 1.5 days in the forests of Oahu? It sure beats running on roads, or does it? Leadville 100, also known as LT100 or The “Race Across The Sky”, was made famous thanks to Christopher McDougall’s 2009 best selling book, “Born To Run”, in which he chronicles the American debut of the mysterious Tarahumara Indian ultra runners of Mexico. Leadville 100 was conceived by avid marathoner Kenneth Chlouber to bring back life to and revitalize Leadville, Colorado, an old mining town already steeped in economic decline. LT100 first took place in 1983, with the Tarahumara first competing in the race in 1993 and 1994, winning both years. In 1994, the Tarahumara took on famed American runner Ann Transon and defeated her, although she set a female course record of 18:06:24, which still stands. The book also introduced to the world, the now deceased Micah True, better known as Caballo Blanco. Legends such as Matt Carpenter (12-time Pikes Peak Marathon winner and LT100 course record holder, 15:42:59 in 2005) and Marshall Ulrich, who completed a Leadville 100 + Pikes Peak Marathon (PPM) “double” over the same weekend in 1992 & 1993, including a 120 mile drive from the LT100 finish to the PPM start in Manitou Springs, CO. Although there are other high altitude 100’s in the Continental U.S. that many consider to be harder than Leadville, such as Hardrock 100 and Wasatch 100, this Race Across The Sky is more well-known and is still an extremely challenging race, featuring +/- 15,600 feet (+/- 4,800 m) in elevation change, with altitude ranging from 9,200 feet to 12,620 feet (~2.5 miles above sea level). If that’s not enough, runners have to pass through the infamous Hope Pass, along the way, which is known to attract lightning strikes during the race. Did Kino leave one off his list that you would include? If so tell us! Kino is member RIF #88 of Run It Fast – The Club. Join him in RIF-The Club HERE!